Note: The following is a guest post submitted by Jane Byrnes, resident of the East Front Neighborhood, located in the District. Sidewalks are good for riding bikes on and walking on, and many people don’t have them. They are safe and not killing any bugs or flowers. They are safe for all ages especially little kids. When you drop something you can see it. You can go on cement without trespassing on people’s property. Sidewalks take you places you couldn’t go, and if you fall you won’t get a grass stain. You can walk to friends’ houses to talk and play, and you can walk to school and back from school. On sidewalks you can walk, run, jump, ride bikes, play a game, ride a mini-motorbike, ride a scooter, ride a tricycle, ride a unicycle, ride a mini-car and hot wheels, skate, walk dogs, duck-and bird-feeding, hopscotch, bike-racing, running-race and jumping-race. You can find bugs on sidewalks for bug collectors. You can look at roses near sidewalks. You can pretend to be something on a sidewalk. You can set up lemonade stands near a sidewalk. Now count how many things you can do on a sidewalk: over twenty four things, and twenty one out of twenty four are healthy. One of the reasons I like my mixed-age neighborhood is that it has kids, kids with their own wonderful perspectives like Zach’s sidewalk essay here. This neighborhood also has millennials, Gen Xers, retirees and plenty of in-betweens. Some chose their spaces 40 years ago and some last month. Me, four years ago I chose a small house in the East Front neighborhood. EF shares its northern boundary with the Douglas Design District (DDD). EF folks like Wichita. Look at the first frame of this 2017 Chung Report, that EF street has five Wichita flags along its row of friendly porches. And more and more, Wichitans like walking. According to this Wichita Area Metropolitan Planning Organization Report, Wichitans are walking and biking 80% more than they did seven years ago when the official Bike-Ped Count began. Pedestrians made up 71% of the total in 2018. East Front has sidewalks, and so does the Douglas Design District. We are walkable! As a fan of healthful walking AND happy neighboring, imagine my delight when I downsized into a right-sized house within a well-established neighborhood association. The EF Neighborhood Association (EFNA) has a bi-monthly newsletter. For some years, East Front has announced and carried out a yearly cleanup day. This March it’s also trying out a Scavenger Hunt for those who live and work between Douglas and Kellogg, Grove and Hillside. Businesses within EF have donated prizes for the end-of-March drawing, and more prizes and interactions are welcome. All Scavenger Hunt finds are visible from the sidewalk. City planners call our convenient locations within DDD a “node”: we can easily walk to shop for groceries, hardware, wine and seasonal celebrations such as Christmas lights. We have delicious choices to meet up for coffee and dinner. We can walk to East High or catch the Q-line. Within EF and DDD, we can do all 24 of Zach’s sidewalk activities. And more. Sidewalks, sidewalks, sidewalks. Walkability, walkability, walkability. And neighbors, neighbors, neighbors. Thanks DDD, for your good neighboring with EF. Note: The following is a guest post submitted by Jordan Walker, Digital Director for Greteman Group, located in the District. Jordan is also a volunteer for the DDD’s Promotions Committee. About seven years ago I was working at Cox Communications, just beyond the current boundaries of the Douglas Design District. On my way to work, I would zoom past Douglas, avoiding it at all costs. Mostly due to the kamikaze students dodging the cars in front of East high but also because there really wasn’t a lot going on. I would eat lunch at the office. I went home most nights after work. It was purely an area for me to be in. Fast forward to 2015 where I made what I believe to be the best career move and landed a position at Greteman Group, perfectly situated in the heart of the Douglas Design District. Right as I felt like my career was starting to heat up, so did the neighborhood around me. Our not-so-little corridor of creativity has blossomed in the last few years and has become one of the best places for a young professional to work. Nothing to Do Here – Not. I’m not exaggerating when I say that my life revolves around this district. Although I don’t live in the district, between work and my leisure time, I can be found hanging out, dining, shopping and biking in the DDD. I’m no longer tied to the office for lunch, I look forward to inviting colleagues for a bite to a few of my favorite spots like Tanya’s Soup Kitchen or the Hill. For dinner, we might grab a bite at the Anchor or the Wine Dive. When I need a break from my three computer screens, I have the luxury that Hyde Park is a one-minute walk away. In fact, having the park so close to our office has been one of the best perks for our agency. It’s the perfect spot for us to picnic, walk our office dogs and take our twice-weekly YMCA workouts when the weather is nice. Just beyond Hyde Park is another favorite spot – Central Standard Brewing. More often than I’d like to admit, I can be found there after work trying a new beer and catching up with friends. And let’s be honest, after trying that new beer, we might walk over to Hopping Gnome and get another beer. Why? Because we can! We have so many options within walking distance. 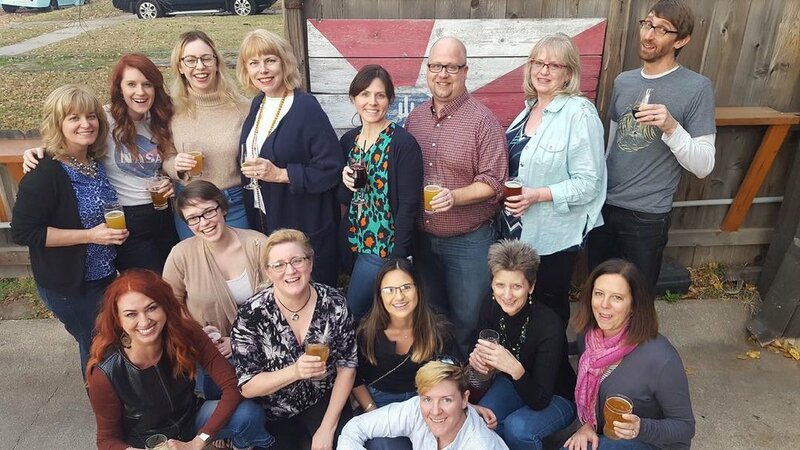 Did you know that the Douglas Design District in all its coolness is primarily run by an all-volunteer network, many of which are also business owners? I sure didn’t when I first began working here, but it’s that volunteer network that has opened my eyes to many opportunities to get engaged in this community. After my first year of joining Greteman Group, I was recruited to join the DDD promotions committee and never looked back. Together we’ve created events, podcasts, Small Business Saturday promotions and launched initiatives to support our collective goal of creating a thriving community that supports small business and the neighborhood that surrounds it. This is a group of change agents that inspire one another on a daily basis to achieve greater. And as a young professional who wants to see Wichita move forward, I can’t ask for a better group to challenge me to get more involved in community conversations. To ask better questions. To dream big. To want less talk and more action. You’ve probably heard this question quite a bit – what’s your why? When you dig deep down inside, what is it that truly motivates you? For me, my why has always been that in anything that I do, I want to feel like I’m leaving a lasting impression and working in the Douglas Design District has given me that opportunity. I know, so millennial of me, right? Knowing that any volunteer effort that is poured into our district will help businesses, residents and the culture of Wichita is such a gratifying feeling. But more importantly in the not too distant future when we’re hopping the Q-Line down Douglas and the sidewalks are packed with life, we’ll remember the start to something really cool in Wichita started right here in the DDD. The Douglas Design District Board of Directors has elected their new leadership team for 2019. Stacy Ward Lattin of Hopping Gnome Brewing Company will step up as the Board President, with Steven Suellentrop from Legacy Bank as Vice President. Staryln Tayrien from Jimmy’s Egg/Hartman Companies will serve as the Board Secretary/Treasurer. Janelle King will continue to serve on the leadership team as Past President. We’re very excited to usher in this new leadership team, as they each bring a very special set of skills and passion to the work of the Douglas Design District. The DDD Board of Directors is composed of 10 members, including the leadership team. There are current Board openings; any DDD members that might be interested in sitting on the Board can contact Renee Duxler, Executive Director, at renee@dddwichita.com. Note: The following is a guest post submitted by Ken Stoppel, owner of Building Controls & Services, located in the District. Ken is a former Board Member with the DDD, as well as a current Executive Committee Member and has been placed on the Business Improvement District Planning Committee. As a lifelong Wichitan, I am pleased to support the efforts of the Douglas Design District to better their district and my hometown – the city I love. The DDD is a tireless advocate for community betterment. From adding over 40+ public murals to the District over the last four years, to the innovation of a colorful painted streetscape on Douglas, to encouraging local shopping with the Artisan Market and 2ndSaturday collaborations—the DDD is committed to creating a vibrant neighborhood while also encouraging local commerce and growth. They also have initiated difficult but necessary conversations about our current infrastructure on Douglas, and they continue to dare to ask ‘what if?’ These conversations seek to understand what would make Douglas Avenue more walkable, and lead to more local businesses and residents choosing to locate in this vibrant area. Studies show that young people choose where to live based on the quality of experiences a city offers. We have to offer better experiences in our city – and a progressive and forward-thinking long-term capital investment will deliver one. The DDD is also exploring the possibility of creating a Business Improvement District within its project area as well. City Council appointed a District Planning Committee to explore the concept further. The details – budget, scope of services, value proposition, any assessments – will be developed in the coming months then shared with community stakeholders. It has been mistakenly communicated that this proposal would be a tax—it is not. It’s the possible creation of a funding model where area businesses contribute toward the betterment of the District – just like you see with a homeowner’s association assessment in residential areas, or a Common Area Maintenance charge in retail areas. If implemented, stakeholders in the area – i.e., businesses paying the assessment – get to decide how the money is spent – not City Hall. A BID would engage more businesses in decision-making that affects the District. Self-governance by stakeholders is a fundamental principle in the 1,000+ BIDs around the country. The DDD is currently a member-based organization that collects voluntary membership dues. There has been no staff – only a group of doers invested in their community. But they get things done – and recently did the legwork needed to increase investments and funding into the District that allowed for hiring a full-time Executive Director. The potential moving forward with Renee Duxler as the Executive Director at the helm is truly inspiring. James Chung identified a “culture of no” mindset in our city that has held us back way too long. Let’s keep building, trying new things and proving our naysayers wrong. I support a “culture of yes” and believe in the exciting future of the Douglas Design District. The Douglas Design District is pleased to announce that we have hired Renee Duxler as our Executive Director for our non-profit civic organization. Duxler will run day-to-day operations for the District, and is also charged with increasing community engagement, attracting new business and industry, and advancing exploration into a possible application as a Business Improvement District. The Douglas Design District has never had an Executive Director since it’s inception in 2007; the DDD has been run by an all-volunteer Board, as well as contract workers from time to time. Duxler has been a Board member with the Douglas Design District over the last several years, but resigned her position in November when she closed her business, Aerial, within the District. Duxler has previous experience as an administrator for non-profit organizations, and also helped co-chair the 2020 Vision campaign for the District that secured over $25,000 in investments, as well as a two-year $84,500 grant from the Knight Foundation Fund at the Wichita Community Foundation. As a small business owner and former social worker, Duxler has a unique skill set that she believes will serve the District well. The Douglas Design District is a non-profit civic organization and neighborhood, with over 300 locally owned businesses, including 100 member businesses, who are dedicated to pursuing and promoting our ‘corridor of creativity.’ Founded in authenticity and steeped in old-time tradition, the Douglas Design District is full to the brim with electricity. Shop, Live, and Dine… By Design.